← Shooting Videos with Creativebug! 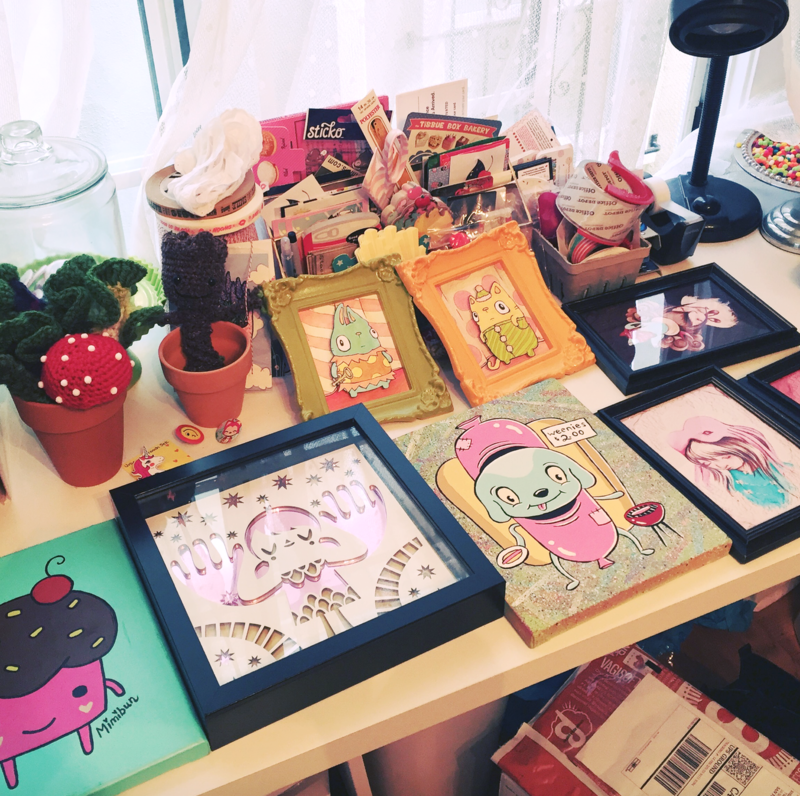 Fully moving into my new craft space – since switching it to my dining room – has been kind of a process of fits and spurts. One of the last things I needed to do was hang my art, but it never really seemed that pressing and important compared to other things on my to-do list. 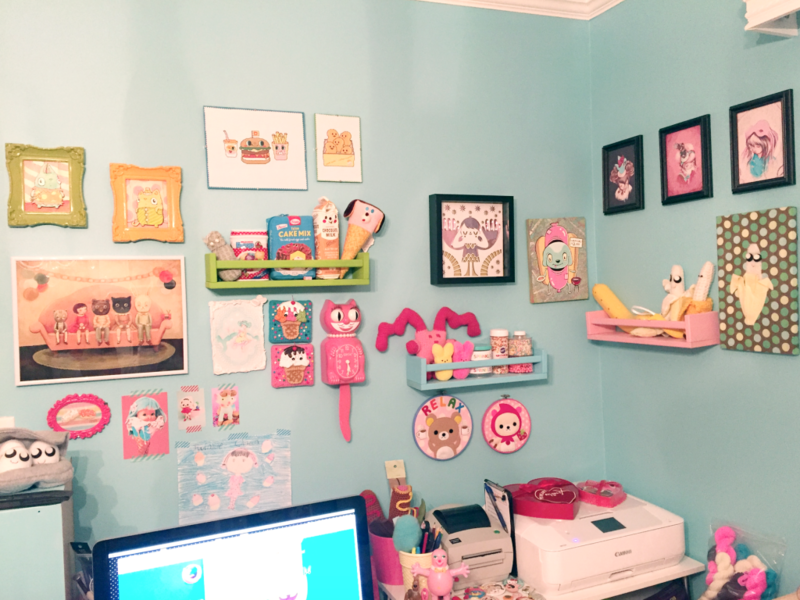 However, a camera crew is coming through soon, and this prompted me to ask Manda to help me hang everything. I’m not a really good spatial organizer, and also, I don’t really care so much, so I asked Manda because that kinda stuff is really important to her, and I figured her opinion on how to arrange everything would be helpful. 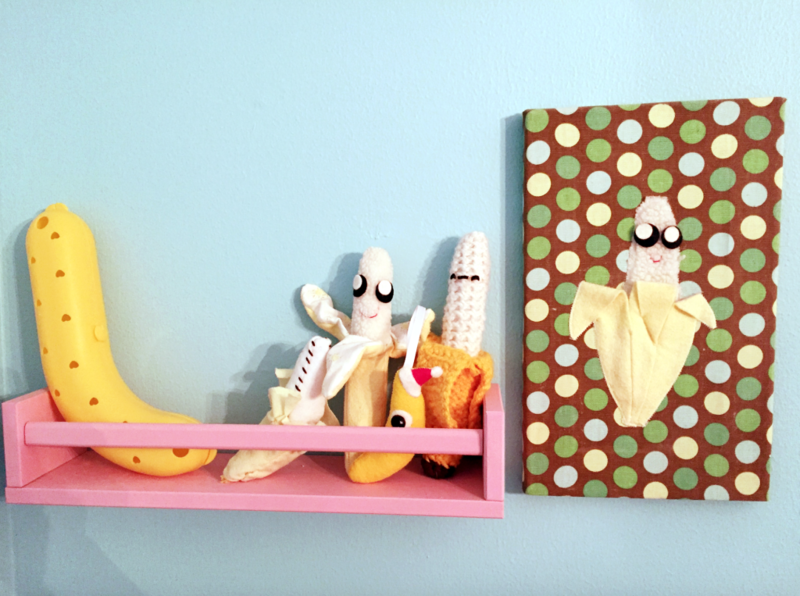 We decided to start with my BANANA collection (which is looking kinda puny and sad right now….. I NEED MORE NANNERS). After breaking the ice with the nanners, we started creating other vignettes until they all sort of melded together. These are just quick iPhone photos that I snapped. 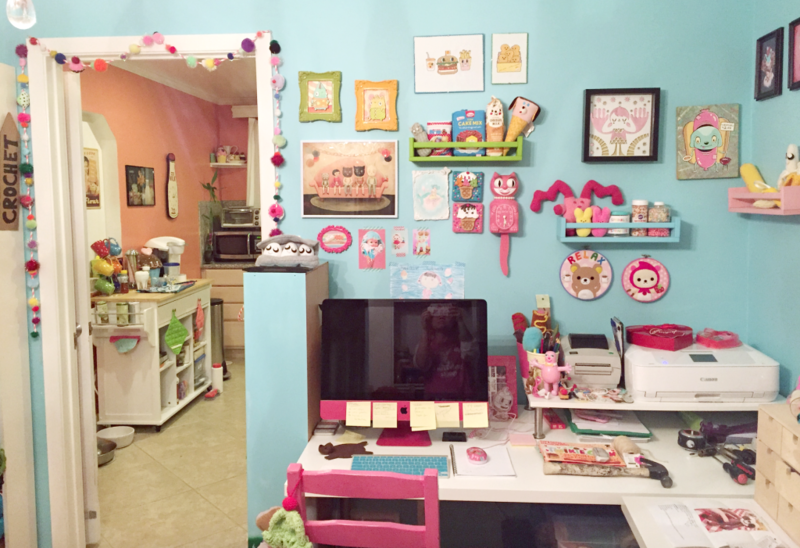 I know my house is super cluttery, but that’s just sort of the way I am: not a minimalist, and always working on stuff! Manda did all of the hammering and everything, and since there is a table in front of the wall, she did some crazy stretching and lunging to get all the nails in. That’s what BFFs are for! She was like, “How do normal people hang art! ?” And I was like, “I dunno. THEY HIRE SOMEONE.” It’s not perfect, but there is a definitely a good feeling in the room in real life. Once I get everything done in there (need to hang some curtains to hide ugly things like storage and supplies) I will definitely film a room tour for YouTube! I think I want to crochet a cozy for my desktop monitor, too! 6 Responses to How they hangin? Looks great. I could use someone to help me with pictures and stuff because I’m not good about putting things on the wall attractively. I’ve always felt like putting a room together was not one of my strong points! 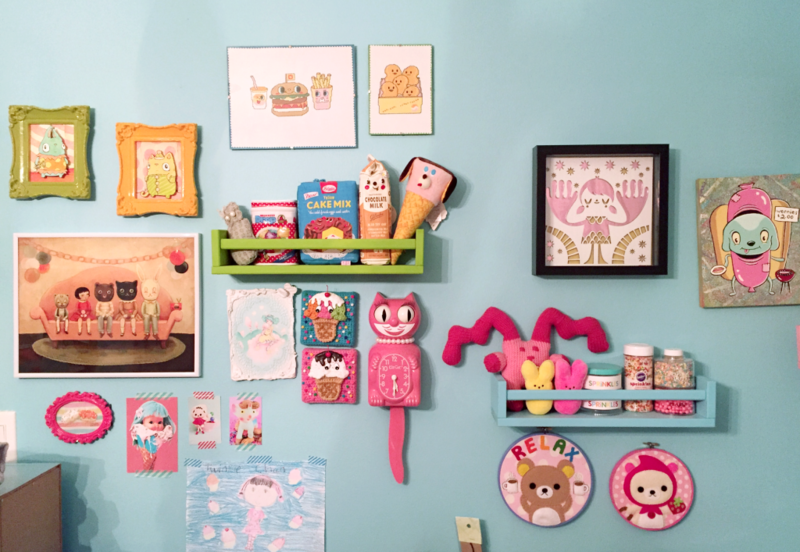 I love your kitty cat wall. I especially like your cat clock, it reminds me of the one that my friend had when I was a teenager (a million years ago). 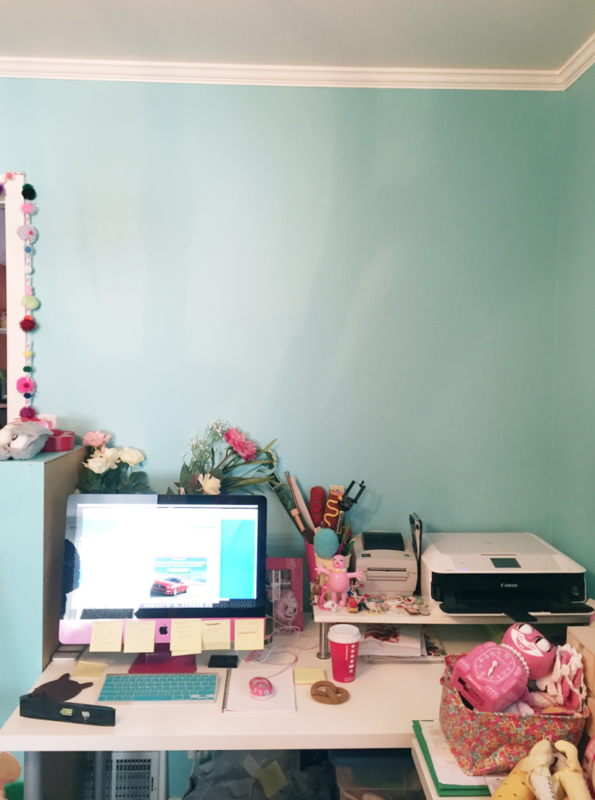 I think you are doing a great job of recreating a new work space and making it very inspirational. Manda did a good job!